Today, finally get the chance to use Gimp 2.8 stable release. What a surprise to experience the new and very sought after UI improvement. Of course, this is not exactly a new thing. Has been available since Gimp 2.7 and even before that due to Gimp open source nature. However, 2.8 is (and supposed to be) a stable release. So in a way, this is major step ahead and send the right signal to its user base. Hopefully this will negate past developer attitude when it come to user request for improvement. Hell freeze over might be a better title. After all GIMP developers have for so long insist on not having such UI. To the point of many small improvement or work around. Such as dockable utility windows and exiting Gimp after the last edit window is closed. Alas, such improvement did not really address the UI clutter and non usability. Hence this new Single Window mode! Before we proceed further. Let's enjoy the cluttered window view for one last time. This is how Gimp looks like to most people who who tend to edit multiple image. The desktop is typically in the background. It is advantageous with ability to drag image files from desktop into Gimp. The clutter start when one use another program alongside it. A typical scenario is launching web browser while using Gimp. And then pressing Alt-Tab (or use the taskbar) to go back to an edited image. First of all desktop is no logger in the background. This is now the browser since it was the last opened window. Other editable Gimp window are also hidden by the browser window. So to get back to having Desktop as background with all edit window open will require lots of adjustment. More works when navigating through many open application at the same time. It is not enough to wrestle with making windows bubble up to the foreground. When ever changing background is most of the time a distraction. Only way to rid that distraction is by maximizing current edit windows. There goes the advantage of viewing multiple image at the same time. To the chagrin of the user, the maximized window does not stay on top. But covered by utility windows that function as short cut to various functions of Gimp. The prominent example is Tool window. But typical users will have more than one of such utility window opened. These utility windows will overlaps each other, vying for your attention! Editing large image or zooming in for detail will then become an exercise of moving stuff out of the way. As well as clicking here and there to get the tool you need in front. In short, the UI tends to get in your face instead of getting work done! Not to forget the most annoying feature of Gimp. It economically and efficiently use Windows taskbar as a way to navigate between edit windows. Yes, I am talking about that Window taskbar that have Start Bar, commonly use application ico and list of currently open application. When using Gimp; all those window clutter will also clutter the taskbar! To be fair. 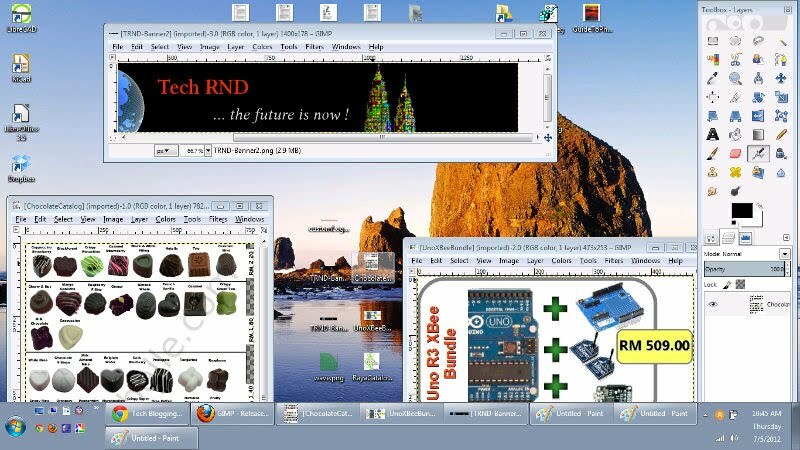 Gimp was originally developed for Linux on Gnome Desktop Environment. Which have been enjoying Virtual Desktop functionality built in and by default. In such environment, Gimp works well as one can open it in a virtual desktop with its own taskbar. Not so for Windows user. The more you love it, the more cluttersome it become. Just awesome! So Gimp 2.8 come with optionto enable what we call Single Window mode. To enable this mode. Open up the Windows menu and click Single Window mode check box found at the bottom. The solution is in the form of tabbed window UI. With other utility window neatly docked and conveniently out of the way. Gimp 2.8 also allow multiple column of such docked window. Which further make thing customizable according to user need. Apparently one can still have floating utility window as long as it is not the Tool window. Which is locked at the right hand side of the screen. Also, there is no way to float or view two image at the same time. Hence the aptly named Single Window mode. No more Windows taskbar clutter. If more than one image is opened, they are shown at the top as tab with image preview. Moving between editors is much like navigating in tabbed browser such as Firefox or Chrome. Let's see some screen shot. Simply love it. Expect this one mean open source graphic editing program to get more use in the near future! But read the closing first. Because not all is rosy with this posy. The Gimp has been well known as one clunky foxy. There is still existing or new issue that is noticed while writing this article. 1. It crash few times. Can easily result to lost of works, so safe often. This is an irony since Gimp 2.8 is a stable release! 2. Tabbed UI is not an ideal MDI (Multiple Document Interface) for viewing or editing few pictures at the same time. This is often useful during copy/paste operation or when comparing pictures. 3. Column for docked utility windows is a move in the right direction. Would be nicer if the colum can further split into rows or at least top and bottom area. 4. One not so obvious trick of drag and drop file to open them in Gimp. Is to drag it into Tool window until the mouse cursor showa the plus icon.It will be more obvious to drag a file into the tab area. Doing so result to nothing happen even though a mouse cursor with plus icon is shown. 5. In one occasion, dropping a file into Gimp cause it to automatically maximize the whole application window. Annoy me much since I was planning to drag and drop some files. 6. This next one make me think that Gimp developers are sadistic. The coolest feature of gimp is ability to save to multiple format. Which is a breeze. Just open the save window and save by typing different extension like ".jpg" or ".png". It work great with "Save As" and "Save a Copy". This no longer true. Now one need to use the Export command in File menu. Otherwise this error message will be shown. "You can use this dialog to save to the GIMP XCF format..." Why oh why developers! Albeit all this clunkiness. For me, there is still hope. Just think of it as year one for an open source release. All those annoying points tend to get fixed sooner or later. Let's hope it is sooner rather than later.